In this issue, you’ll find articles about Election Day, our litigation work relating to the Enloe Dam and Dungeness River rule, our Annual Winter CLE, and more. Read the October 2018 issue of Washington Water Watch here. Hirst decision. Hirst changed how counties could approve or deny building permits that use permit-exempt wells for a water source. 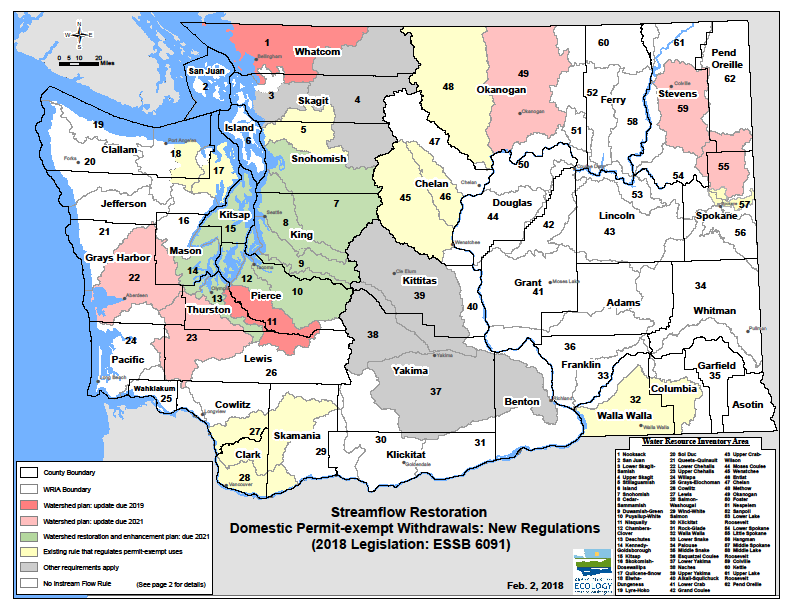 The law, RCW 90.94 Streamflow Restoration, helps protect water resources while providing water for rural residents reliant on permit exempt wells. The law directs local planning groups in 15 watersheds to develop or update plans that offset potential impacts to instream flows associated with new permit-exempt domestic water use. The law splits up these watersheds into two groups: those with previously adopted watershed plans and those without. 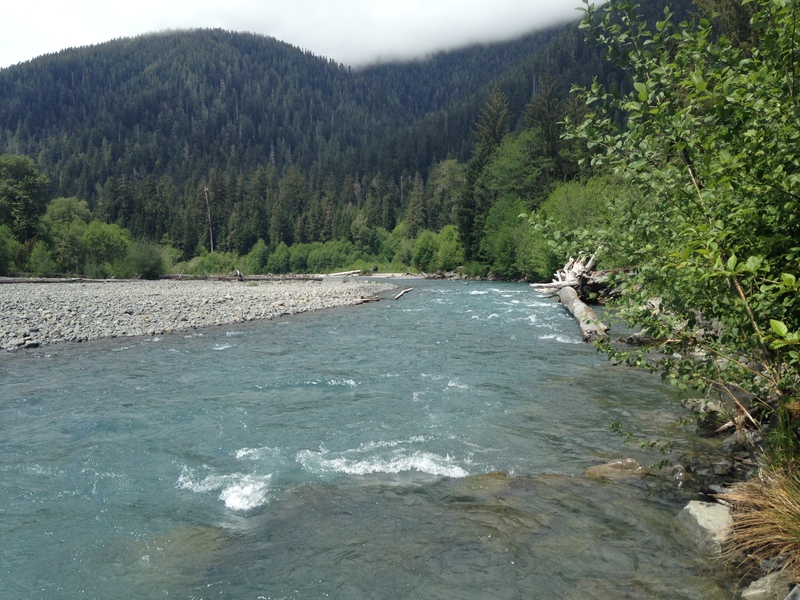 The Nooksack, Nisqually, Lower Chehalis, Upper Chehalis, Okanogan, Little Spokane, and Colville basins all have previously adopted watershed plans. For these seven basins, local watershed planning units are to update their watershed plan in order to compensate for the impacts of new permit exempt well uses. 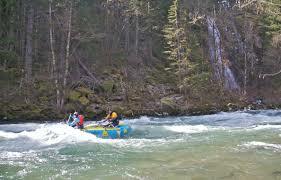 The law identifies the Nooksack and Nisqually basins as the first two to be completed. They have until February 2019 to adopt a plan; if they fail to do so, Ecology must adopt related rules no later than August 2020. Planning units in the Lower Chehalis, Upper Chehalis, Okanogan, Little Spokane, and Colville basins have until February 2021 to develop their plans. Until watershed plans are updated and rules are adopted in these seven watersheds, new permit-exempt wells require only payment of a $500 fee. The maximum withdrawal is 3,000 gallons per day per connection on an annual average basis. Ecology will establish and chair watershed committees and invite representatives from local governments, tribes, and interest groups. The plans for these watersheds are due June 30, 2021. New permit-exempt wells require payment of a $500 fee.. The maximum withdrawal is 950 gallons per day per connection, on an annual average basis. During drought, this may be curtailed to 350 gallons per day per connection for indoor use only. Building permit applicants in these areas must adequately manage stormwater onsite. CELP has been appointed to participate on the Snohomish, Cedar-Sammamish and Duwamish-Green watershed planning units, and we have volunteers participating in several others. 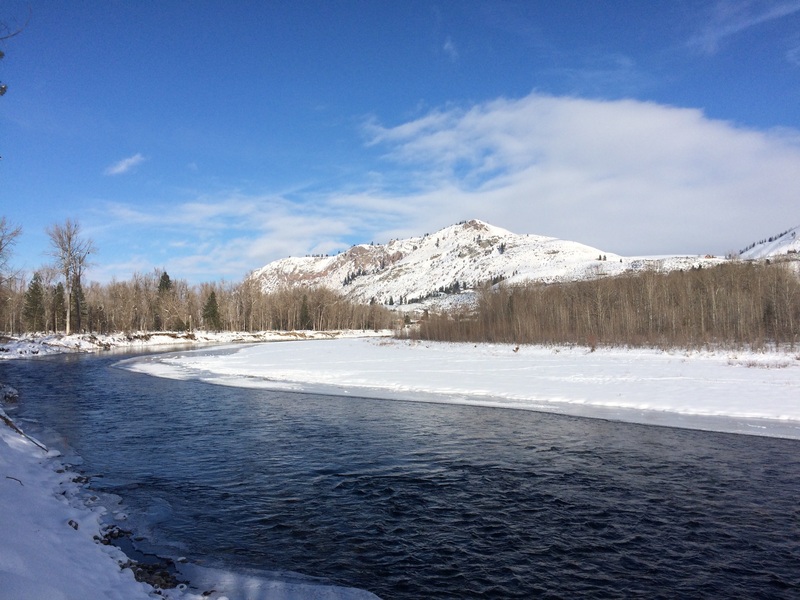 The law also provides $300 million until 2033 for projects that will help fish and streamflows. Watershed planning groups will recommend proposals for funding by Ecology to achieve this. The long-running battle to remove this environmentally damaging and economically unjustifiable Enloe Dam continues. 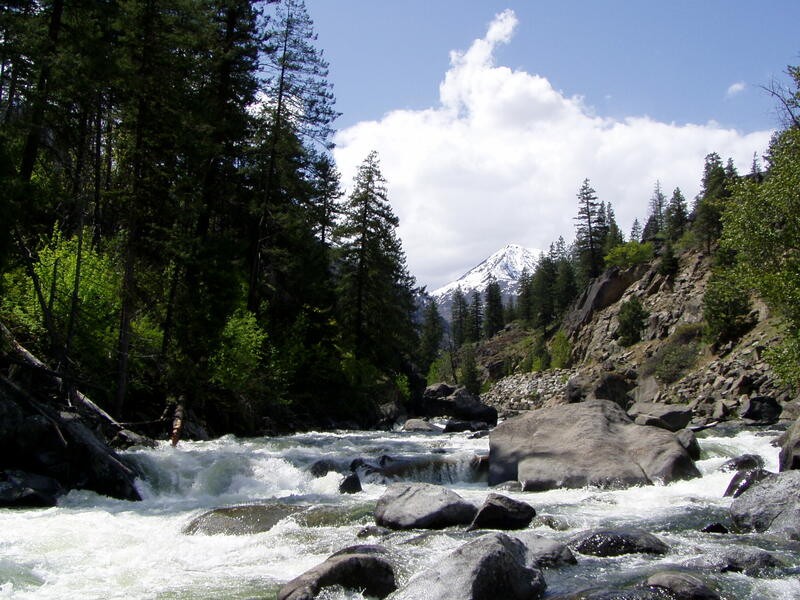 A major tributary to the Okanogan River, the Similkameen flows through 122 miles of potential salmon habitat in British Columbia and Washington. A fish-blocking dam was constructed on the River in 1922 and has not generated power since 1958. The Okanogan County Public Utility District (PUD), which owns the dam, is attempting to restart power generation at the dam. The power the dam would produce is not needed and would be much more expensive than the PUD’s current sources of electricity. 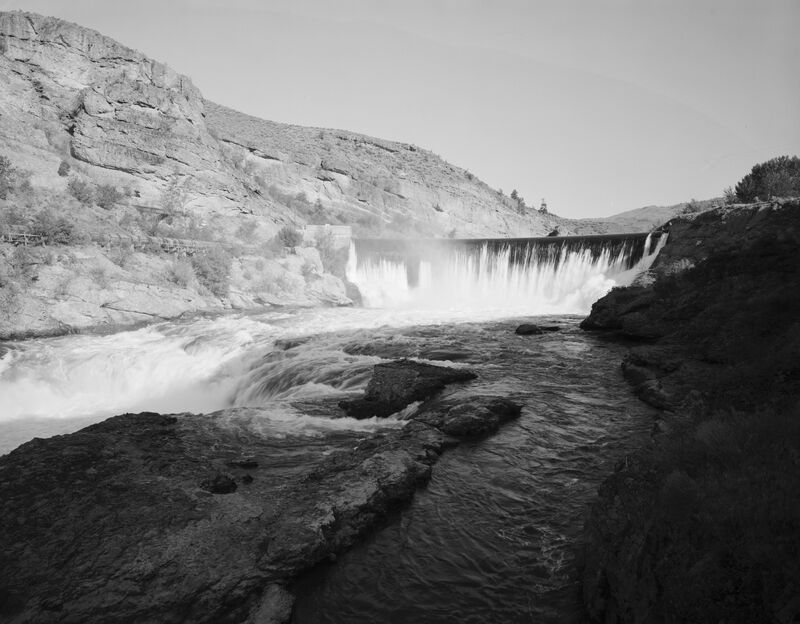 On September 13, along with the Sierra Club and Columbiana, CELP filed a Notice of Intent to Sue the Okanogan County PUD as well as the National Marine Fisheries Service (NMFS) and the Federal Energy Regulatory Commission (FERC) over the dam’s effect on ESA-listed Upper Columbia steelhead and Chinook salmon. The Notice is the first step towards filing a lawsuit under the Endangered Species Act. We contend that the dam unlawfully harms ESA-listed fish species, that the process of evaluating the dam’s impact on fish was inadequate, and that FERC unlawfully failed to consult with NMFS regarding the listed fish, as the Endangered Species Act requires. In a separate action, CELP has asked the 9th Circuit Court of Appeals to review FERC’s giving the PUD additional time to begin construction. The Federal Power Act requires that construction be started within the period of a hydroelectric license, and allows only a single two-year extension. When the PUD failed to begin construction within the required time, FERC “stayed” revocation of the license, effectively giving the PUD additional time. CELP believes that FERC lacked authority to “extend” the license in this manner and that it should have allowed public participation in the license amendment process. Learn more about the notice here. This case (Bassett et al. v. Ecology, Case No. 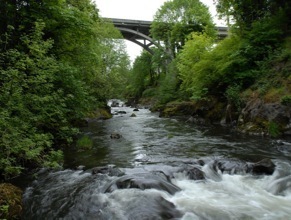 51221-1-II) is a challenge by a group of property rights activists and developers to the Department of Ecology’s Instream Flow Rule for the Dungeness River, WAC 173-518. CELP supports the Rule, which provides for mitigated use of new permit-exempt wells while protecting instream resources. After the plaintiffs filed suit against Ecology, CELP joined in the case as an intervener to argue in favor of the Rule. CELP and Ecology prevailed in Thurston County Superior Court, and plaintiffs appealed. Division II of the Washington Court of Appeals heard oral argument in the case on October 18 and we are now awaiting the Court’s ruling. In this issue, a recap on Celebrate Water, a tribute to former CELP Board President and Ralph W. Johnson Water Hero Award Nancy Rust, an update on the Culvert case, an introduction to CELP’s summer legal intern, Meredith Bro, and more. Read the July 2018 issue of Washington Water Watch here. In this issue, a legislative wrap up, an article on the impacts of the Hirst fix, more information on Celebrate Water and Give BIG, the latest edition of Watersheds to Watch, and an introduction to CELP’s newest staff member, Nick Manning. 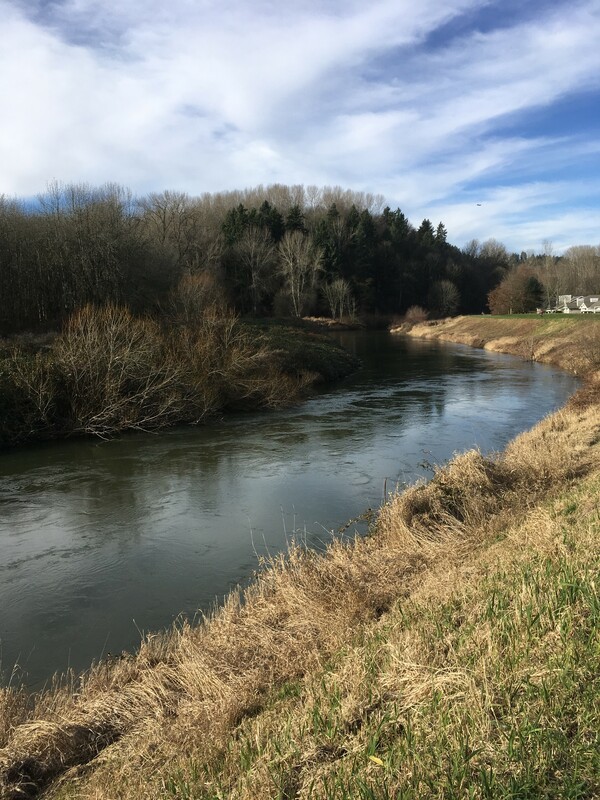 Read the February/March 2018 issue of Washington Water Watch here. In this issue, an article on the flawed “Hirst fix” recently passed by the WA State Legislature, an update on the Leavenworth Hatchery case, an in-depth article on the real impact of permit-exempt wells and the Hirst fix, the save the date for Winter Waters Event in March, and more. Read the January 2018 issue of Washington Watch Watch here. The last issue of 2016 is here! Read a preview of what to expect during the upcoming legislative session, an article by CELP’s Dan Von Seggern on the recent Hirst decision, and a summary of our December CLE. 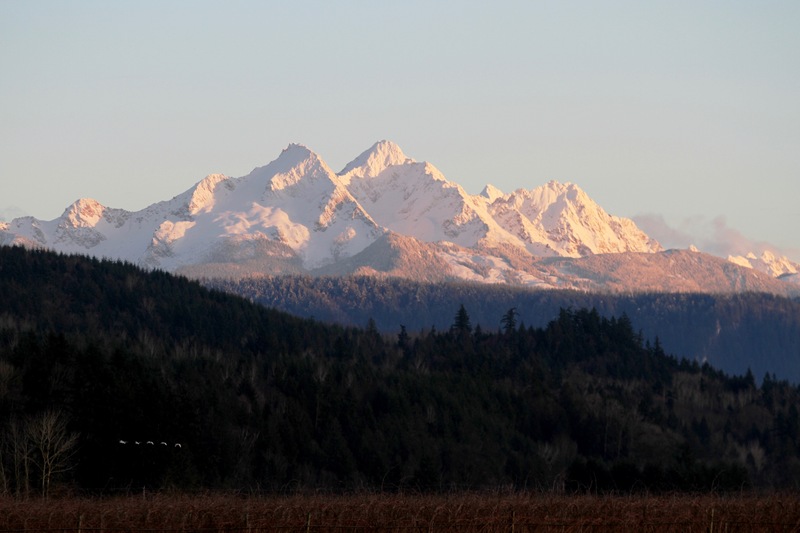 Read Washington Water Watch: December. 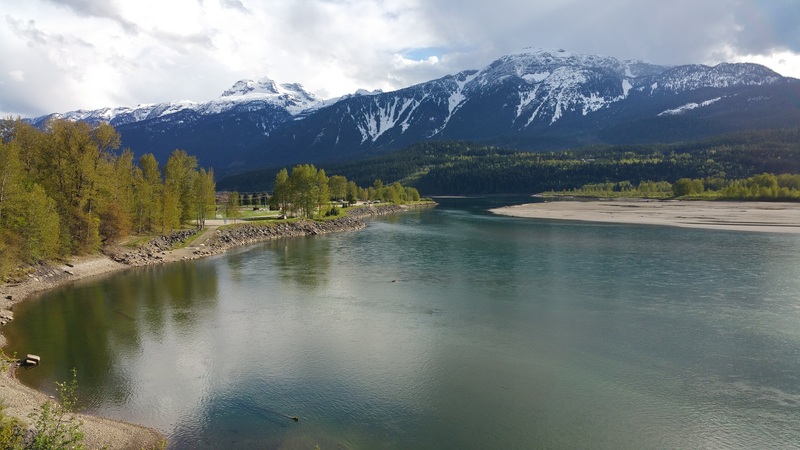 Click here to read the May issue of Water Watch. Summer is coming! This month’s issue of Water Watch features information on our upcoming Celebrate Water event, an article on our letter to Governor Inslee about restoring higher flow requirements on the Spokane River, a “Love Letter to a River” by CELP member Pat Sumption, and an introduction to CELP’s newest board member, Jill F. Johnson.